[T]he grace of mutual charity among the living, which derives from the Sacrament of the Eucharist so great an increase of strength, is further extended by virtue of the Sacrifice to all those who are numbered in the Communion of Saints. For the Communion of Saints, as everyone knows, is nothing but the mutual communication of help, expiation, prayers, blessings, among all the faithful, who, whether they have already attained to the heavenly country, or are detained in the purgatorial fire, or are yet exiles here on earth, all enjoy the common franchise of that city whereof Christ is the head, and the constitution is charity. For faith teaches us, that although the venerable Sacrifice may be lawfully offered to God alone, yet it may be celebrated in honour of the saints reigning in heaven with God Who has crowned them, in order that we may gain for ourselves their patronage. And it may also be offered - in accordance with an apostolic tradition - for the purpose of expiating the sins of those of the brethren who, having died in the Lord, have not yet fully paid the penalty of their transgressions. A Mass may be offered for the living or for the dead, and this has been the practice since the Church's first days. St. Augustine, for example, famously records in his "Confessions" some of the last words his mother said to him. St. Monica told her son, "Lay this body anywhere, let not the care for it trouble you at all. This only I ask, that you will remember me at the Lord's altar, wherever you be." Catholics remember their beloved at the Lord's altar by offering their Masses -- their reception of Holy Communion -- for someone's specific intentions, such as thanksgiving, conversion, physical healing, to honor that person on a special day, the releasing of souls from Purgatory, etc. They do this by simple prayer before or after Mass, such as "I offer this Mass for the benefit of my sick friend." And Catholics more formally ask a priest to offer Mass for their cause. These more formal offerings are called "Mass intentions." 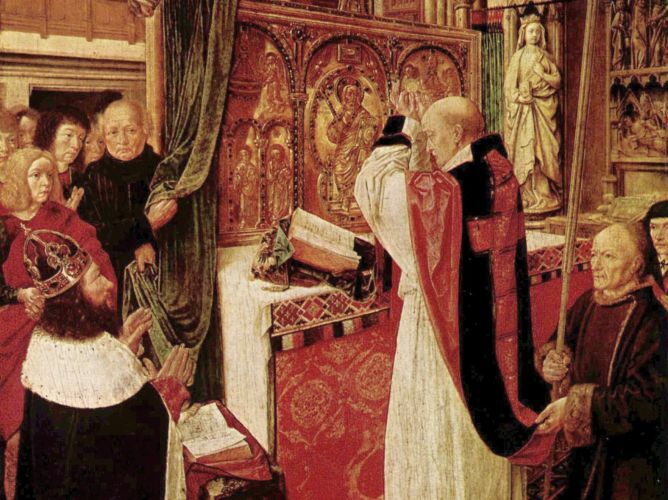 A Catholic may ask any priest to offer Mass for a certain intention, whether or not the priest is personally known to him, whether or not the person is able to attend that specific Mass. When requesting this, money plays no inherent role. No one can ever "buy a Mass." But it is customary to offer what's called a "stipend," a small amount recommended by a priest's Bishop. As I write, the typical stipend amount is $10. A Catholic can offer as much as he likes, however, but no money is required to ask that a Mass be said for a specific intention. Because the merits of the Mass are infinite, any number of intentions may be made in a given Mass, but a priest can only receive one stipend per day, no matter how many Masses he offers that day (though note that priests usually offer a single Mass a day, with some expections, such as on Christmas, on All Souls Day, where there is a shortage of priests, etc.). This is to remove even any appearance of simony. Often, but not always, when a Mass is offered for a specific intention, notice is made of that fact in parish or chapel bulletins. You can simply ask your priest in person or by phone to offer a Mass for your cause, or you can put your stipend along with a note detailing your intention into an envelope and drop it in the offering basket at Mass. Parishes, chapels, chanceries, and religious orders sometimes offer specially marked envelopes for this purpose. When a Mass is offered, it's customary -- depending on the intention -- to send Mass cards to those who'd be comforted by knowing that such a Mass is being offered. For ex., when a friend is sick and a Mass is arranged for his benefit, sending that friend a Mass card letting him know that a Mass is being offered for him is more powerfully comforting than flowers. 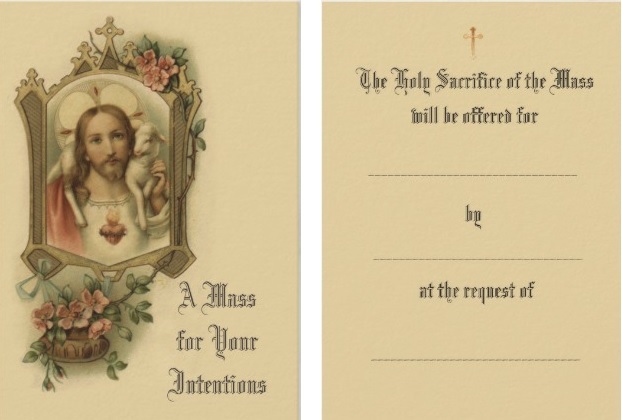 Such Mass cards can sometimes be found in parish offices and in chanceries, or can be purchased from religious orders or priestly fraternities, from Catholic stationers, or from places like E-bay or Zazzle online. See also the pages on Votive Offerings and Spiritual Bouquets.